Rabash, “Concerning the Importance of Friends,”: We can see that a person may see faults in his neighbor’s children, but not in his own. And when someone mentions some faults in his children, he immediately resists his friend and begins to declare his children’s merits. The Light influences us and thus builds everything. We are a material, clay, play dough in its hands. Depending on the angle at which it shines, on its frequency and color, we are formed from this piece of clay, from the earth. 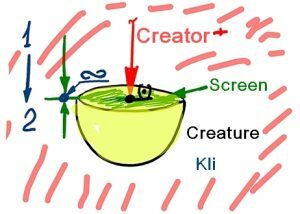 As it is written in the Torah, the Creator “took from the dust” completely non-living matter and began to sculpt it. It is the primary material. Everything else depends on the Light. We thus cannot attribute any bad or good qualities, actions, or anything else to a person! Only the intensity and the quality of the portion of Light that influences the person determines his entire essence. Question: Where is free choice in this? Answer: There is no freedom in this. Freedom is only in compelling the Light to influence us better and more intensely under the influence of a certain environment. I cannot act on my present states. I can only invite, through the environment, a stronger influence of the Light upon myself, and it will change me for the better. My free choice is only in this, and it is the only way to somehow change something. If I, however, do not aspire for this, the influence of the Light will seem evil and bad to me. This is the path of suffering. Yet, if I rush forward under the influence of the environment, then all my future transformations from egoist into altruist will be desirable. Then, the same path will become good for me—the path of Light. The difference between the desired and the actual must be correctly formed in the group, and then the attracted Light will fulfill our desires. Where Can You Get The Strength To See The Friends Above Yourself? Question: What kind of independence can we talk about if the Creator creates all desires and states in me and He is the only source of all pleasures? Answer: If I, with the help of the Creator (the upper Light), make a restriction and a screen on myself, then the Light does not enter me anymore. I place a barrier between myself and the Light and I begin to control it. I want the Light to transform me, to first make me not receiving, and then giving. 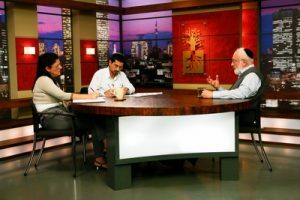 Question: So, in Kabbalah, a person does not need actions, but only attempts to do something? Answer: A person does not need to do anything. The whole spiritual world is in our thoughts and desires. Question: So what is the technique? How do I move from the egocentric state, where I perceive everything within myself, to feel something outside of myself? Answer: This requires upper Light. We must attract it so that it will act on us more and more intensely. This is achieved through group study. After all, we do not engage in this science in order to become smarter. After a couple of hundred of such actions, a person will begin to understand what we are talking about, to feel what is happening in him, outside of him. Gradually, new organs of sensation of the upper Light will appear in him. Question: So this means the method is that a person attracts some kind of energy, Light, force. How does he understand that this energy is affecting him? Answer: He feels that he changes. The meaning of life for him becomes more pronounced, clearer, and more intimate. He begins to understand how to implement this technique, to achieve the feeling of the upper world here and now.